texture: chewy w. medium thickness --- everyone has their preference, and this is mine! chips vs. chunks: chunks --- I like sizeable pieces of chocolate in my cookie. nuts or other add-ins: NONE!! Don't substitute the pastry and bread flours w. AP flour. I really believe that the combination of the pastry and bread flours give the cookie a nice slightly crunchy exterior giving way to a really tender middle. Hand chopped chocolate chunks, NOT premade chips - I will purchase a hunk of the best bittersweet chocolate that I can afford and hand cut them into chunks. The easiest method to chop a block of chocolate: nuke the block at 50% power for a few seconds, no more. It softens the chocolate just enough. Then take a large kitchen knife and chop away! 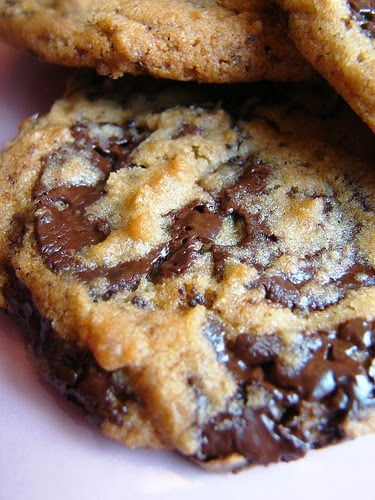 Your effort will be rewarded with really nice ribbons of melted chocolate throughout the cookie. Chill the cookie dough at least 24 hours (I let my dough sit anywhere from 2-3 days) before baking. This is not for taste reasons that were recently written about in an article from NY Times (god forbid we're aging cookie dough...let's leave that for wine and cheese). IMHO, refrigeration makes a difference with the look and texture. I think the dough sets in a way so when you bake the cookies, you end up with the lovely wrinkles and folds as the balls of dough spread and bake. Preheat oven to 350 degrees. Line baking sheets with parchment paper or nonstick baking mats; set aside. In the bowl of an electric mixer fitted with the paddle attachment, cream together butter and sugars. Reduce speed to low and add both flours, baking powder, baking soda, vanilla, and chocolate; mix until well combined. Using a 4-ounce scoop for larger cookies or a 1-ounce scoop for smaller cookies, scoop cookie dough onto prepared baking sheets, about 2 inches apart. Cool slightly on baking sheets before transferring to a wire rack to cool completely.